The President’s Daughter by Ellen Emerson White. Feiwel and Friends, 2008 (originally 1984). Currently Available. Face Value: When this book was originally published, in 1984, it had this cover. ** It looks like the 80s, that’s for sure. It’s patriotic, and a little childlike. It’s painfully of its time. But the sweatshirt/jeans/sneakers look Meg is sporting is totally accurate to her clothing choices as described in the book. And then, in 1994, the same book was reissued with this cover. I read this one in 5th grade. I remember liking this cover, which is just as much of it’s time as the previous decade’s. Looking at it now, it’s ok. Meg is a little more glammed up, but still in jeans, and the angsty lean outside the White House look is definitely a little more adult. The copy I read for this review was from the 2008 reissue of White’s whole series. And I think these new covers are stunning. Taking their inspiration from famous paintings gives the book an iconic feel, capturing the magnitude of the presidency without the gimmicky red-white-and-blue patina of the 80s and 90s covers. We still see Meg’s sweatshirt, jeans and sneakers, but the sweatshirt is a zip-up hoodie now, and those jeans are definitely low rise. I love that we don’t see her face, but we still see her whole body, and that the White House looms in the distance, but doesn’t overtake the whole image. It’s a definite upgrade. Does it Break the Slate? OMG YES. As has been mentioned maybe a couple of times on the blog this week, we have never had a female president. As pathetic as that is, it’s incredibly exciting to read about one, even if she’s fictional. President Katherine Vaughn Powers is everything we want in a candidate – smart, informed, funny, capable. She has the qualities we look for in the leader of the country. And yet, she isn’t perfect. She pushes herself to the limits, she snaps at her family, she struggles to be everything to all people. And yet Meg, and the readers, find ourselves with an overwhelming sense of respect for her. 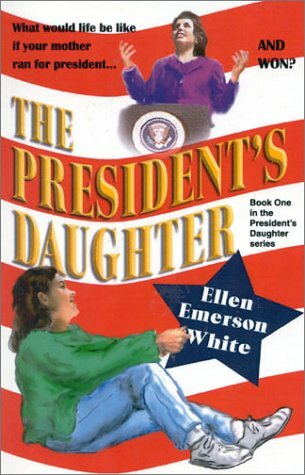 It is depressing to think, however, that White first wrote this character in the early 80s, and when the books were reissued more than 20 years later we still haven’t had a female president. So President Powers is enough to make the book a Slatebreaking title. But then there is our fabulous heroine Meg. Brilliant, funny and flawed (much like her mother), Meg is one of my favorite kind of narrators. Her emotional journey through the book is terrific. Who would we give it to? As we gear up to the 2012 presidential election, I find myself simultaneously compelled and fatigued by the onslaught of election coverage. This book offered the perfect antidote, giving a personal lens to a family as they experience an election cycle and the early months of a presidential term. There’s the perfect balance of research, and real political insight, and personal, fictional narrative. Review: As I mentioned, this book was originally published in 1984. 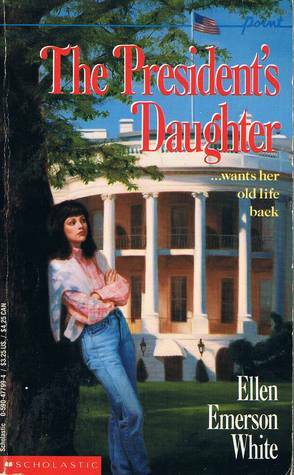 I read it in the mid-1990s, and remembered loving it and it’s two sequels, White House Autumn and Long Live the Queen. I hadn’t thought about them in years though. But, in 2007 (leading up to the 2008 presidential election), Ellen Emerson White wrote a fourth book in the series, Long May She Reign. In 2008, the first three books were published again, this time updated so they took place in the late 2000s instead of the early 1980s. The characters, dialogue and plots remained the same, but the references were changed for a new decade. Surprisingly, this is not nearly as clunky as you might think. The story and the characters themselves translate terrifically well, and it’s not like we’ve had a female president yet, so the challenges facing the first woman elected to the office are still incredibly relevant. There are a few details (mostly, I noticed, in clothing references) that seemed a little off, but overall, it’s very smooth. Plus, the story is so well-told, that I’m thrilled it got a second life for a new generation of readers. We know what’s going to happen in this book. There are no plot surprises. What makes it so interesting is the way the characters respond to all of these events. The decision to run. The primaries. The conventions. The election itself. Inauguration. Secret Service. Media attention. It’s all there, the things we read about this time of year, but we see it through Meg’s hopeful/cynical and deeply personal eyes. “Meg’s favorite song in life was Joan Jett’s ‘I Love Rock and Roll,’ but that was too rowdy for sitting down and being fretful – which was her plan. Something soothing would be preferable, so she went with The Sound of Music, since, secretly, she was a major fan of musicals. But really, once I got into the rhythm of the book and Meg’s character voice, I don’t even notice it. As I mentioned, the readability factor is incredibly high, and the pacing makes the book terrifically exciting. And the feminism – oh, the feminism in this book! Not only are Meg and President Powers presented as such rich, feminist characters, there is tons of commentary about women in politics and the way they are treated. One of my favorite passages comes pretty early on in the book when Meg runs into a cute college boy while skiing who tells Meg all about how Katherine Powers would “probably be good at functions – she’s poised, and God, no one can say she isn’t good-looking. But, you have to have a man at the top.” Meg’s horror, and quick evisceration of his idiocy is incredibly satisfying. And amidst all this conversation we’re still having about whether women can have it all or not, we see this character who sort of does. She is the President of the United States, and she fought hard for that title. She also wants it – desperately, and works for it. She’s a parent, and has raised three awesome kids. She and her husband have a great relationship. And it is not perfect, any of it. We see difficulties in her fight to be successful politically, and her frustrations when things aren’t going well. We hear about times that were not good in her marriage. And we see moments when doesn’t make the right choice as a parent. And this is awesome. Because one of the most brilliant, and radical things White has done here is to create a powerful mother character who is neither saint nor villain. She’s not an absolute perfect “can do anything” sort of fake heroine, who doesn’t lend herself to translation to reality. But she’s not a villainous working mother. She’s a complicated woman, who is a mother and who is also the president. 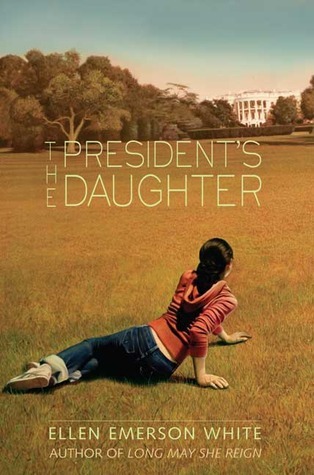 But I don’t want to make it sound like this book is only about a complex portrait of a female president though. Because Meg is our hero, our narrator, the character we empathize with, and she is a great one. And she’s not a bit passive, just waiting for things to happen to her. She is politically informed by choice, quick-witted and quick-tempered, a loyal sister and daughter and a great friend. She’s also impulsive and sometimes selfish. She’s imperfect, as her mother is, but clearly destined for great things. Now that I’ve reread the first one, my next plan is to track down the rest of the series. From what I remember, they get super dramatic from here on out, and I’m really excited to read them. This entry was posted in Reviews, Theme Week, Young Adult and tagged children of politicians, Election Week, Elections, Feminism, presidential campaign, Presidents. Bookmark the permalink. OMG I’m so glad you reviewed this! I LOVE THIS BOOK!!! I probably first read it in the late 80s, maybe? When I was in junior high or so, I think. I’ve reread it many times since, but it might be time for another reread. I would love to hear your thoughts on the 2008 updated books – I think they really worked, surprisingly well. Plus, she wrote a fourth one! I read the fourth one, but I don’t think I read the updated versions of the previous ones. I thought the fourth one worked just fine, though. It was a bit weird to jump ahead 20 years but I got used to it pretty fast and Meg was still Meg. Meg + Preston = <3! NOT that hideous one at the top. That was a reprint by Hawk Publishing Group; Flare Avon is the original paperback publisher. Not sure if there were ever hardcover originals. (Yes, I’m that big of a nerd, but not so big to know if this was a rights revision and resale by author, or publishers buying each other out etc). Thanks for commenting! YES – I love this series too, and I’m a big fan of Ellen Emerson White in general. And thanks for the correction – I am in complete agreement that the actual first cover is far superior than the reprint. I will add a correction to the post. Anyway, I love this series & wanted to say that the top cover is not the original Avon Flare cover that came out in 1984; it’s the Hawk Publishing reprint that was about 10 years later, I think. I’m not sure the history behind the different publishers & the covers. I love how many people love EEW.